Passion Pit is one of those bands that a lot of people really like, and which I can see the value of, but just aren’t for me. I’ll try to out my finger on it dear readers, just for you. Take for instance, the song Take A Walk. In the music video, the director wants us to feel the experience of a ball on it’s path through the city, country, and various places. They accomplish this to some effect, which is really cool. But the problem is that this couldn’t actually happen, so the band has managed to lie to us. But what if a director could evoke that same feeling of travel synthetically and get a positive response? I might just be into it then. Robert Lee Zemeckis is an American film maker and screenwriter. And he is something of an icon in the American cinema, having directed several blockbusters over the past few decades (Romancing the Stone, Back to the Future, Who Framed Roger Rabbit, Forrest Gump, Cast Away, Flight). 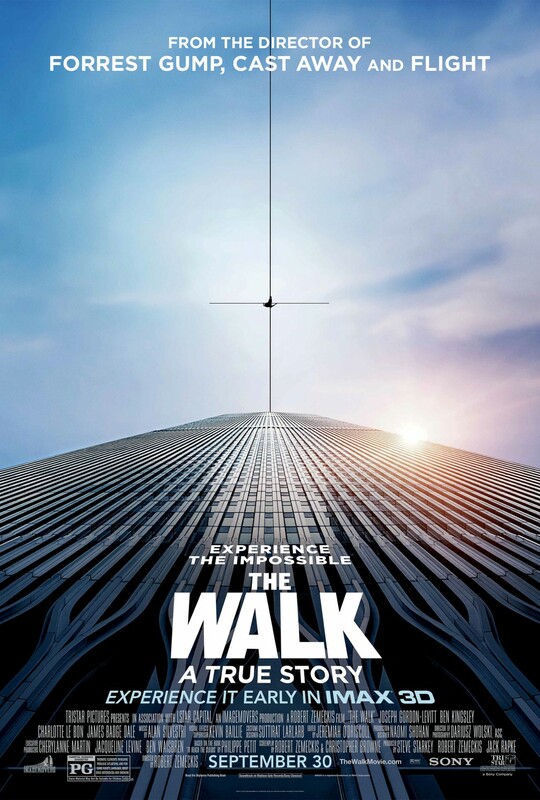 The Walk is his first move since the success of Flight in 2012, but does it get the same Zemeckis effects treatment, that is either lauded or loathed? Let’s read about the story first. Philippe Petit (Joseph Gordon-Levitt) is standing on the highest platform of the Statue of Liberty where he explains his fearless, love of wire walking, and what inspired him to hang wire between the Twin Towers of the World Trade Center and walk it. We go back to Paris, France 1973 and see into his life. He is a street performer who performs illegally and always on the run. One day after biting a jawbreaker candy, Philippe visits the dentist. It is there that he reads a magazine article about the the unfinished Twin Towers. He is inspired to walk across them. After a flashblack, we learn more about Philippe, his first experience with high-wire walkers at the circurs, his parents disapproval when he practiced everyday, and his eventual break-in to circus owner Rudy “Papa Rudy” Omankowsky’s show (Ben Kingsley). Philippe charms Rudy into teaching him the trade and he finally leaves home. On a trip through town Philippe sees a young lady named Annie (Charlotte Le Bon), performing her music to a crowd. He sets up shop and steals her audience. Later she comes to rebuke him, but he apologizes while simultaneously defending himself. It begins to rain, and Annie leaves, but Philippe finds an umbrella and wins her affection. He has his first accomplice. Annie convinces Philippe and her professors to let him practice at her school. This is where he becomes friends with his second accomplice Jean-Louis (Clement Sibony), a photographer. Philippe lands his first performance via Papa Rudy, held over a lake, while a fishing contest takes place. But the fishermen boo him, and he loses concentration, then falls in. After his embarassment, Philippe vows to walk Notre Dame to redeem himself. He prepares at night and performs as tourists arrive in the morning. He succeeds but is arrested. Jean-Louis introduces to Philippe accomplice #3, Jean-Francois, aka: Jeff (Cesar Domboy), who is afraid of heights and can’t speak English. The team travels to New York City for the first time to inspect the towers. Initially Philippe panics at the scale of the buildings, but once he sneaks in and climbs to the observation deck, his passion returns. Upon return home, Philippe organizes the “coup” for August 6th 1974, which is just ahead of winter and the tower completion. Rudy wants Philippe to use a saftey harness, but Philippe refuses and explains it would defeat the purpose of the walk. Rudy changes his mind and he gives Philippe all of his lesson payment money back to allow him to complete the coup. The team returns to New York, and go under cover to learn all of the technical information about the building. During this process Philippe accidentally steps on a nail which goes through his foot. This does not deter him though, and he continues on, without seeking medical treatment. Let’s put on the plot brakes now. Otherwise the whole story is ruined, and you need to witness The Walk to experience the full effect of climax. Pros: The suspense of whether this movie will culminate in what we were all hoping for. When we watch the walk and actually get the sense of dread and freedom expected it. The lead characters all manage to suspend our disbelief that they are in fact not French. Cons: The New York characters feel a little stale, and as a consequence some of those scenes seem to drag on. Some of the dialogue feels a bit forced and the narration by Philippe is unnecessary in places. Points of Interest: There have been reports by some film reviewers that the screening of this film in theaters actually caused people to throw up from vertigo. Robert Zemeckis said that while he didn’t believe it, the goal of the film was to evoke that feeling all the same. As I mentioned earlier, Zemeckis has something of a track record for focusing on special effects, technological tricks, and visually impressing. Whether this has resulted in some bad movies on his part is somewhat subjective. And the real reason why I take issue with Passion Pit is because I was supposed to see them live one year as part of the Sonic Boom festival in Edmonton and they decided to play a DJ set instead of performing their music! So sometimes seeing isn’t REALLY believing. Either way I’d take The Walk! Once it gets to the actual walk itself, it works. Everything before that, I’m afraid, just doesn’t quite work well. Nice review. Thanks! Appreciate your support and recognition of both the challenges and payoff of the film!